Bath Bubble & Beyond is a brilliant range of Bathroom goodies, ideal gifts or treats for yourself and your family, they smell gorgeous and look fun and funky in your bathroom too! Everything is handmade in the factory in Poole, Dorset, and the range of products include bath fizzers and creamers, bath marbles, chefs and gardeners soaps, bath and shower gels, non-foaming bath salts (great for hot tubs and spas), fruity shaped and scented soap sponges (sponges filled with scented glycerine soap) that gently foam as you scrub, bath wobble jellies which are great for kids bathtimes, shampoo bars for all the family and foam bath gels and powders, as well as massage bars and other soaps. The soap filled sponges are fun fruity shaped sponges filled with a moisturising fruity fragranced glycerine soap, ideal for the bath or shower, and the bubbles in the sponge means it floats in the bath, solving the slippery soap problem. Choose from Peruvian Cherry, Tropical Coconut, Lemon and Lime, Scrumptious Strawberry, and mouth-watering Watermelon. Chefs and Gardeners have their own purpose made soap, the lemon Chefs soap deodorises the hands removing stubborn smells such as Garlic and Onion, while the Mint and Geranium Gardeners soap contains almost 50% Pumice to help remove stubborn dirt and grime while at the same time it softens and smooths hard skin. 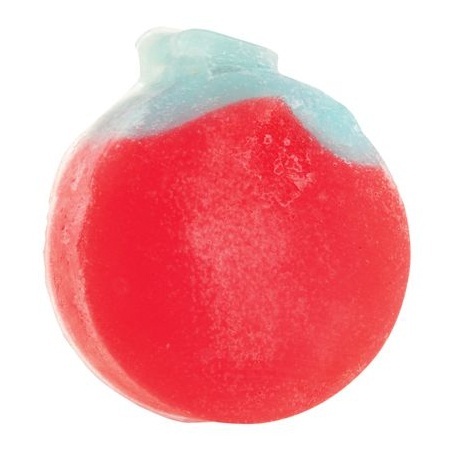 Drop a Bath Fizzer into your bath to release a delicious scent and soften the water with a fizz. A lovely selection to choose from, a little Yellow Duckling with a soft and gentle fragrance of baby lotion and powder. The beautiful scent of Snowmusk, Powdery, floral and soft with undertones of musk and amber, the understated sophistication and delicate elegance is an invitation, alluring and seductive. For Winter gifts and treats, check out the special Bubble Bath and Beyond Christmas special limited editions, immerse yourself in the Spirit of the Season with delightful scents to soothe your senses. 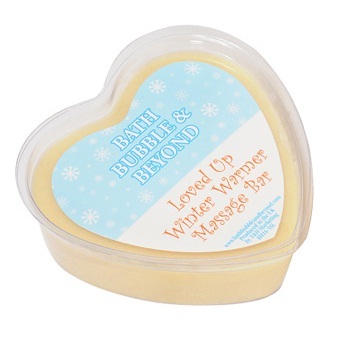 You really will be good enough to eat with the Loved up Winter Warmer Christmas Gingerbread Heart Shaped Massage Naughty but nice massage bar, made with around three-quarters cocoa butter, tastes of Gingerbread when you lick the skin after a sensuous massage with your favourite person. The massage bar has a melting point just above body temperature, the cocoa butter melts easily on contact with the skin and as the other ingredient is finest Belgian chocolate this makes for a great way to spend a cold winter’s night! Delicious! If you prefer to shop by fragrance we’ve made it easier than ever just click this link to take you to the fragrance finder for your favorite bath Bubble and beyond products!